Plot spoiler: Why is it titled Sucker Punch? 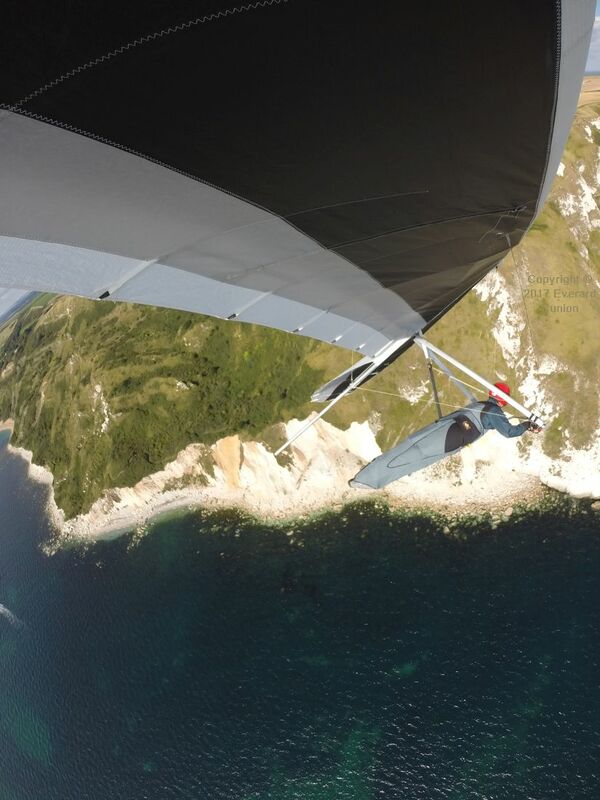 This page continues from Hang Gliding 2016 part 3. 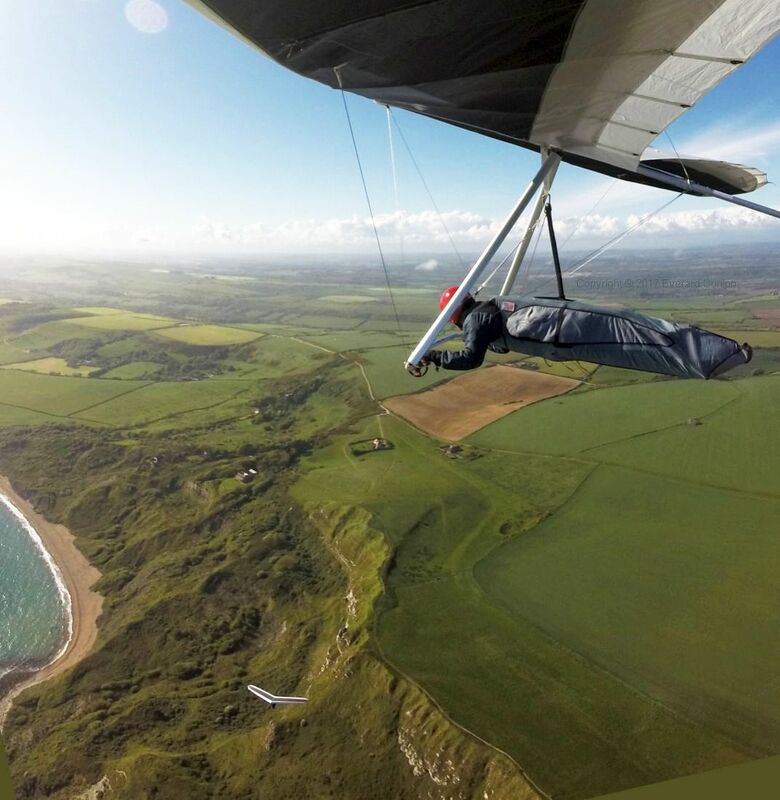 A handful of hang gliders took advantage of classic post-frontal conditions at Ringstead on the coast of Dorset, England, in mid May. I watched from the hill as Steve W, in a high performance rigid wing, curved round an isolated orographic cloud, turned round, and dived through it. Wayne indicates that he has no pressure on my front wires. I am ready to fly! Veteran pilot Wayne B set my camera straight after the struggle from the rigging area (in partial shelter of some bushes) to the launch slope knocked it out of whack, resulting in much better pictures. 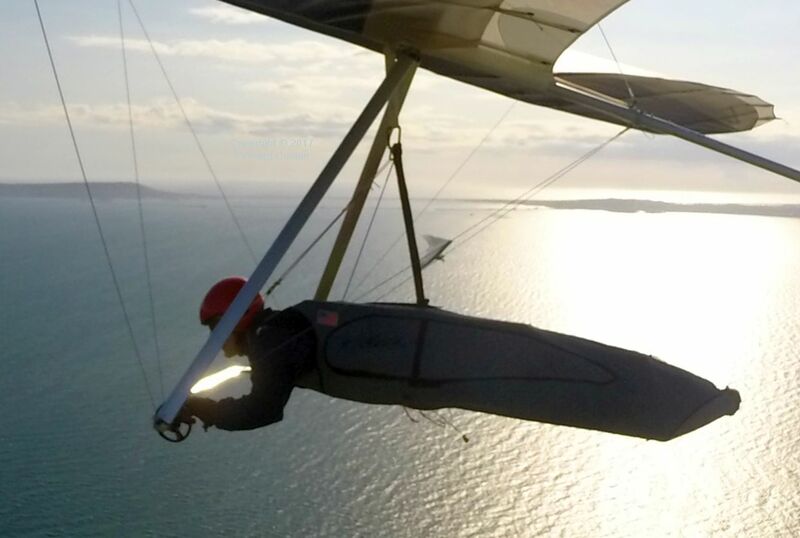 The air was perfectly smooth over the cliffs and sea, but the wind was westerly and strong. 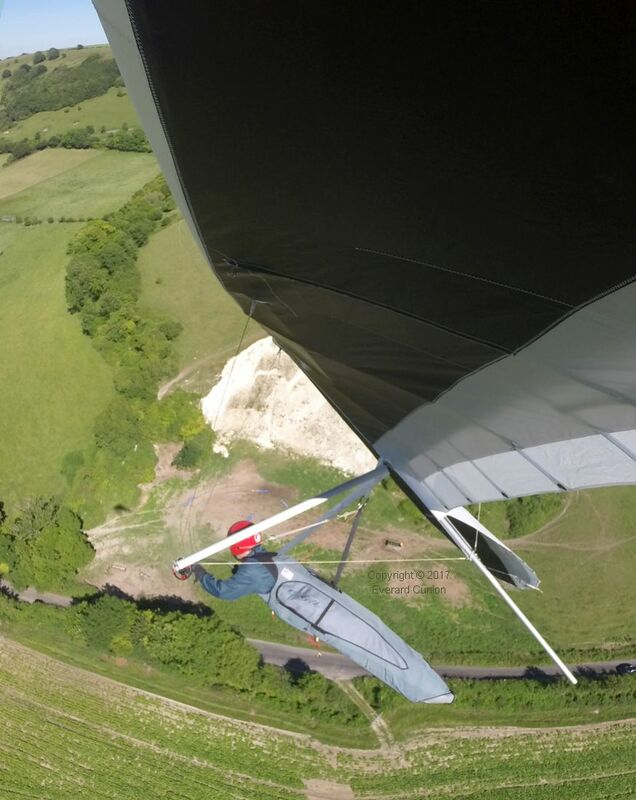 I crossed behind Steve (another Steve) flying a Wills Wing T2, as he threw it around upwind of my track, but well below my height. As we know, an aircraft’s wake travels downwards, so I relaxed and enjoyed the show. Whoomph! My wing lurched to one side and dived, then righted itself. Yes, his wake traveled downwards in air that was rising upwards. Duh! 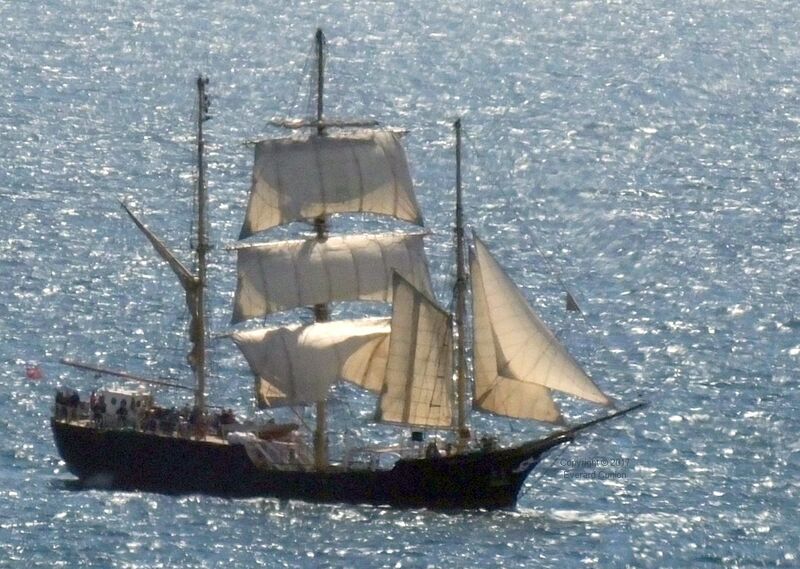 For variety, this is a wooden sailing ship that visited the bay the previous day. It is frequently in the area. Landing in the west wind was the usual roller coaster. In early July at Bell Hill, north Dorset, a cloudy sky in the morning gave way to a sunny afternoon. The lift came and went, and I was headed to the bottom landing field a few minutes after I launched. However, I encountered patches of lift in front of the hill, some strong enough and large enough to circle in. It was a struggle, but I flew for 25 minutes before I felt that I needed to give my arms a rest, so I landed. 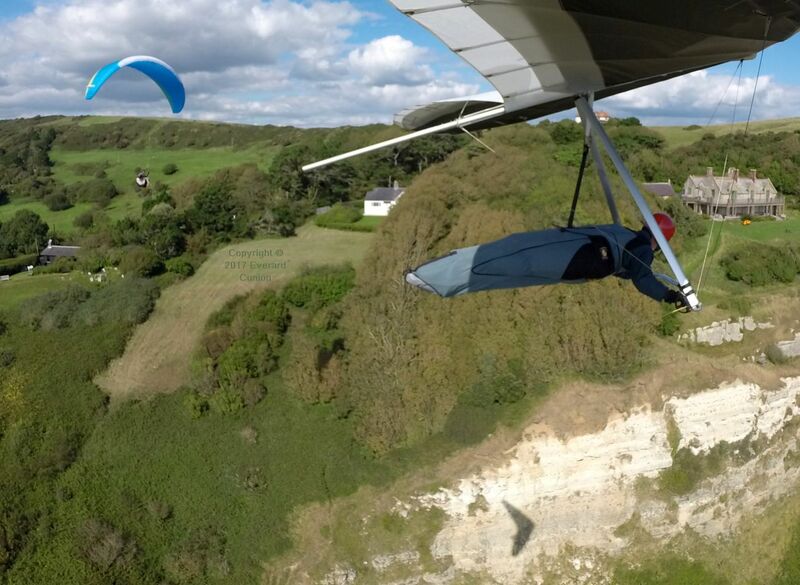 After weeks of largely non flyable conditions, a westerly wind in mid August afforded challenging flying at Ringstead on Britain’s Jurassic coast (Dorset). 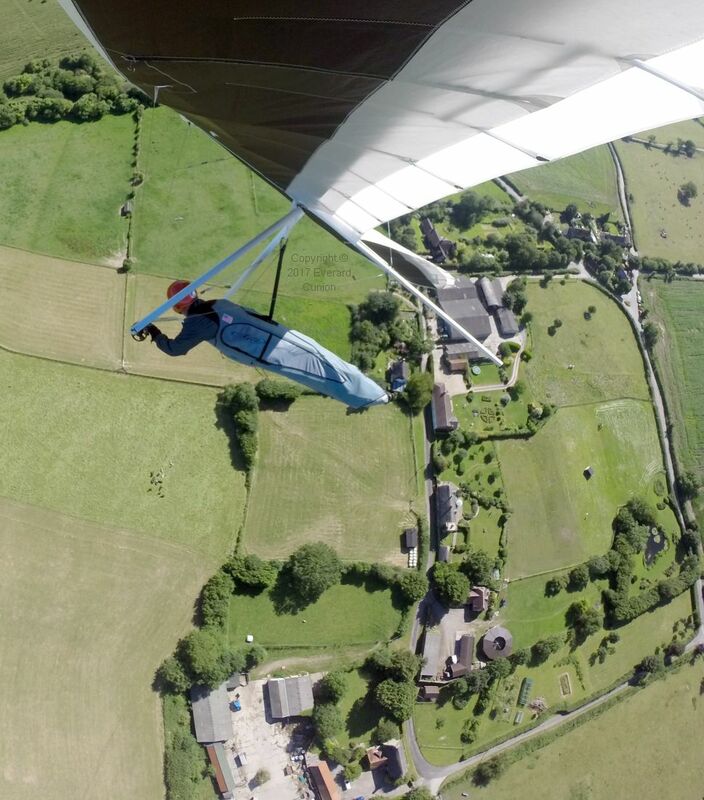 Gary D flew his 30-year old secondhand Airwave 166 Magic 4 ‘Full Race’ for the first time. It is heavy to carry and to ground handle, but it cost five percent of what I paid for my Wills Wing U-2 (new in 2014) and its performance is good even by today’s flexwing standards. 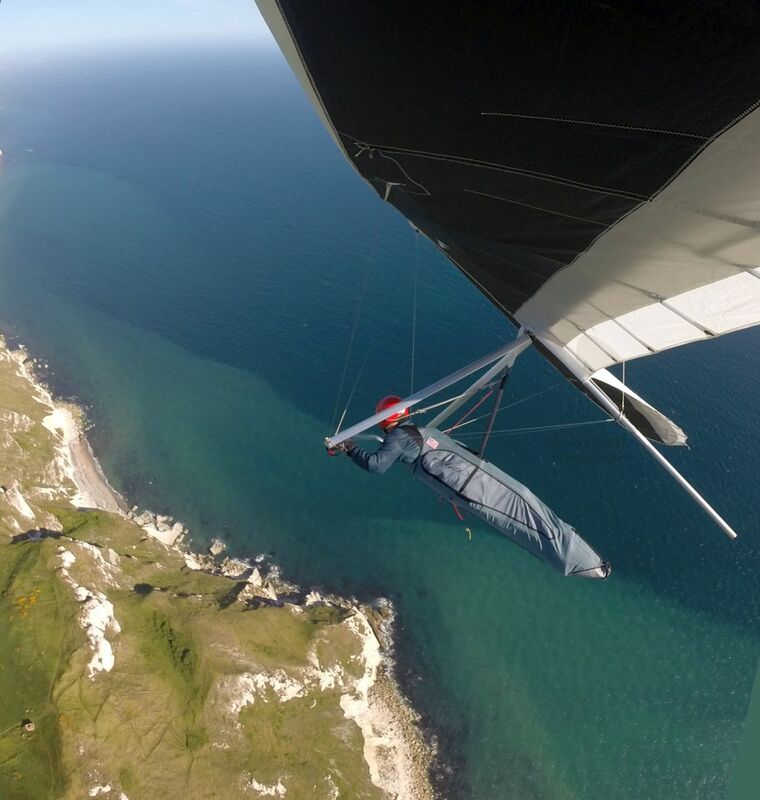 When I launched, the wind was well off to the west and only occasionally strong enough to lift the glider’s weight (about 65 lb) which is a rule-of-thumb indicator I use to judge whether the lift is strong enough for soaring (staying up). Yet, on the main cliff, heading up-wind, I was not moving over the ground because of the strength of the head-wind high over the cliff. 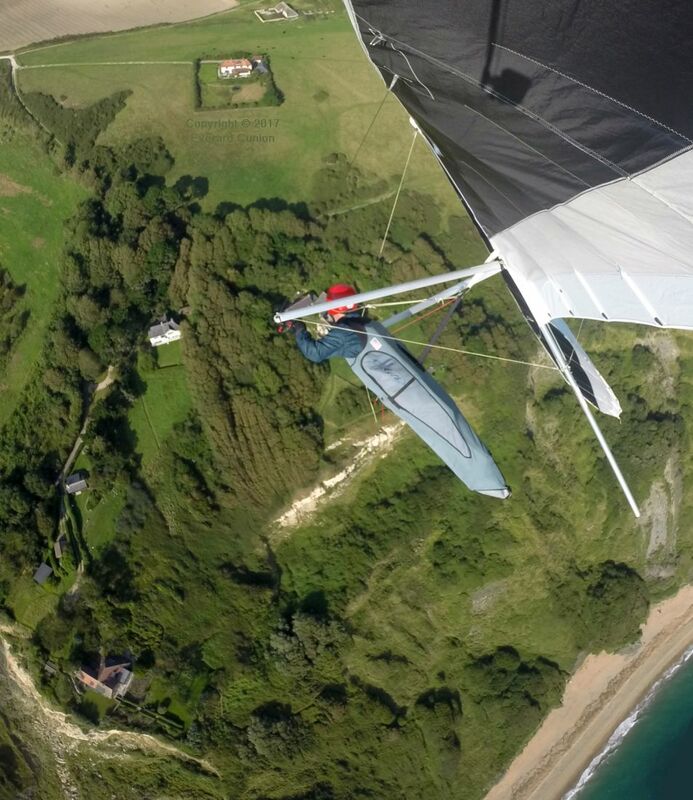 It this photo, Gary’s glider can be seen (just behind my main harness riser) curving round in a sea thermal. 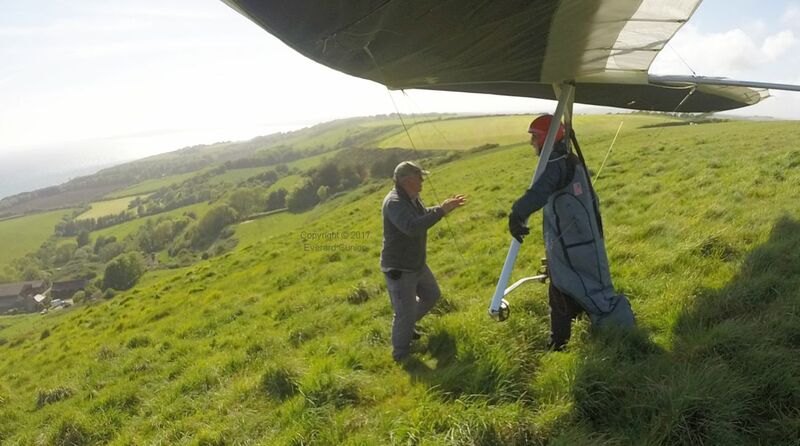 In a strong west or north-west wind, the top landing approach here is almost always turbulent, but when I crossed an invisible boundary near the hill (the top landing field is just behind the ridge top) I was pitched, rolled, and yawed wildly and randomly. I turned away and considered the situation. A couple of years ago I saw another U-2 flipped almost upside-down by turbulence after launching from the ridge here in a strong westerly wind. It occurred to me that there should be a row of black flags somehow strung across the sky there. Gary made an uneventful looking touch-down, so after losing some height and unzipping my harness, I turned inland again and made a successful landing after a roller coaster approach. Light winds at Ringstead on the Dorset coast on a Saturday in early September resulted in a crowded sky.